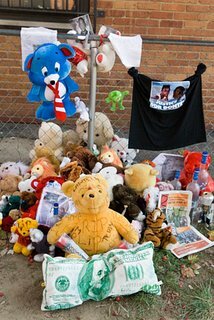 Recently in the Washington Informer Patrice Gaines wrote about Lloyd Wolf’s photographs of homemade street shrines to murder victims in Washington DC. Washington is home to a number of other more high profile shrines – and it’s clear to me that these are more like the “forgotten ones”. I try not to get too high and mighty about politics on the blog, however, we as a nation seem to be more interested in the plight of other people in other nations, and are increasingly turning a blind eye to our own communities. Sometimes our light needs to be turned inward to see the problems we face on a more local level. Lloyds photographs carry a serious “personal is political” philosophy behind them and are all the more powerful because of it. Don’t get me wrong, I know not everyone gets to have a white marble monument, and I know it’s hard everywhere, sometimes it just seems like we become too distracted by the things that are so far away.